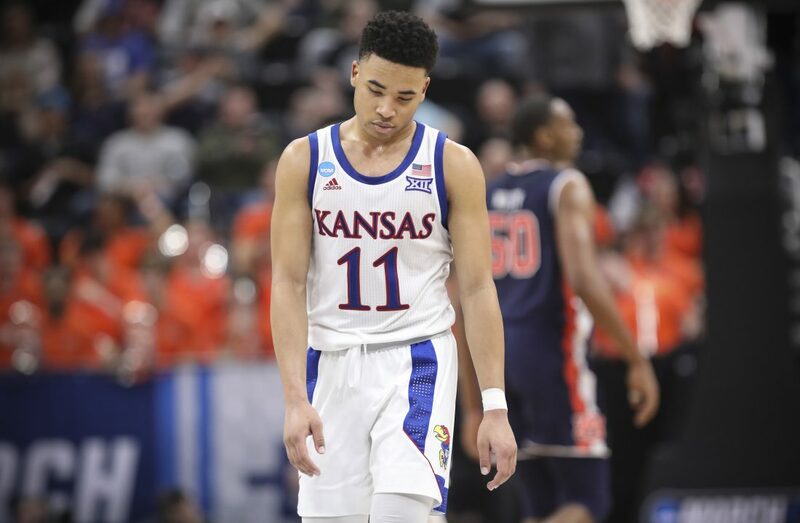 Kansas guard Devon Dotson (11) shows his frustration late in the second half against Auburn on Saturday, March 23, 2019 at Vivint Smart Homes Arena in Salt Lake City, Utah. Salt Lake City — Even if you had not seen a single second of Saturday’s first half at Vivint Smart Home Arena, the vision of the Jayhawks walking off the floor at halftime would have told you all you needed to know. With heads down and mouths open, gasping for air, the Jayhawks quietly filed their way back to the locker room at halftime for the final time this season. Sophomore guard Marcus Garrett was the last to enter the locker room and, as he did, one of the few KU players with more than one game of NCAA Tournament experience had a simple message for his team. It didn’t matter. Heads up, heads down, forward or backwards, the 5th-seeded Auburn Tigers sent KU’s heads spinning from start to finish in a 89-75 second-round NCAA Tournament victory that ended KU’s season. 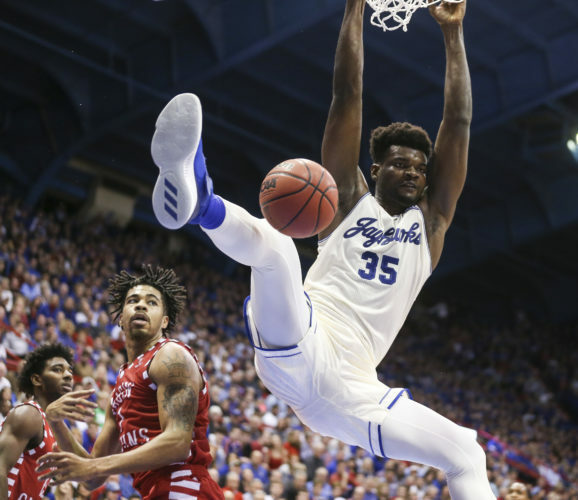 It marked the first time since 2015 that KU has bowed out in the second round and will go down as one of the worst NCAA Tournament losses in school history. The worst was a 60-42 loss to Indiana in the 1940 tournament. “Just to go out like that, you want it to be at least close,” KU sophomore K.J. Lawson said after the loss. And although Saturday’s loss, which unfolded in front of a crowd of 17,792, will forever be linked with that big win by IU — along with last season’s 95-79 Final Four loss to Villanova — it’s not as if the Jayhawks ever gave in on Saturday night. They just could not keep up. Even the KU band got in on the act, blaring the notes of Bon Jovi’s “Livin’ on a Prayer” as the teams warmed up to start the game’s final 20 minutes. The second half began just the way any team in a giant hole would want. Freshman point guard Devon Dotson (13 points in 33 minutes) drilled a 3-pointer from the wing to jump-start the Jayhawks and the shot was as pure and pretty as any KU let fly all game long. The problem was, that bucket and the six in a row by Kansas that followed in the first 4 minutes of the second half shaved just a single point off of the Tigers’ 51-25 halftime lead. By the 14-minute mark of the second half, Kansas had outscored Auburn 24-16 and trimmed the lead from 26 to 18. But the Tigers quickly pushed it back above 20 and never let up in a game that featured Auburn looking like a finely tuned Indy car and Kansas looking like 4-door sedan running out of gas. Junior forward Dedric Lawson delivered his 22nd double-double of the game with 25 points and 10 rebounds in 37 minutes. But the closest Kansas (26-10) got the rest of the way came after two free throws by K.J. Lawson and a three-point play by Quentin Grimes, both of which cut the Auburn lead to 14 in the final 2 minutes. Even with KU showing signs of life, the Tigers continued to torch the nets, keeping both their field goal percentage and 3-point percentage above 60 percent for the first 25 minutes of the game. The Tigers finished 13-of-30 from 3-point range (43.3 percent) and shot 52.5 percent from the floor. KU finished 6-of-19 from 3-point range for 45.8 percent overall. 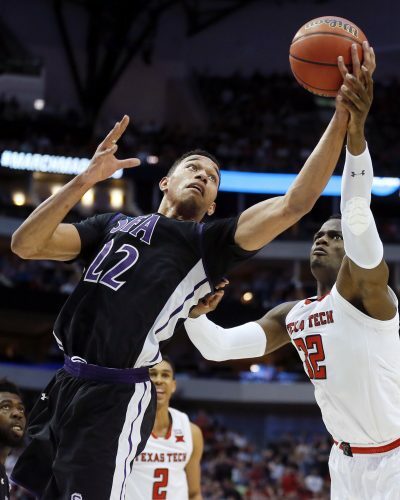 It did not take long for the two teams to demonstrate what type of challenge this would be for the Jayhawks, who finished the season at 26-10. 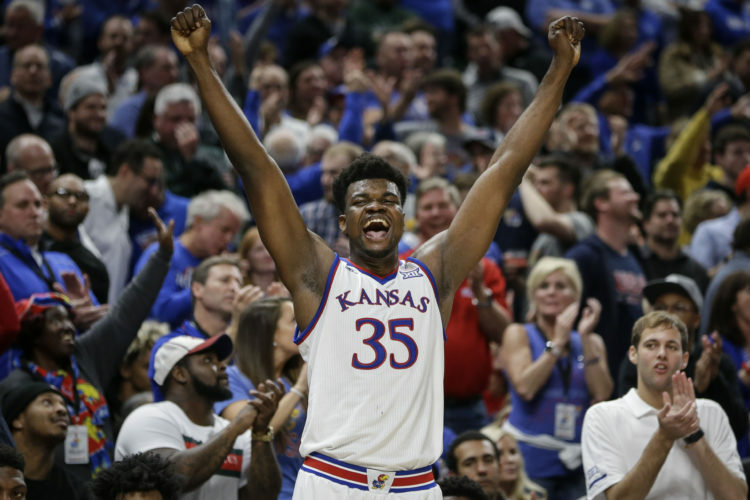 Kansas, which enjoyed a size advantage in its Round 1 win over Northeastern, found early success pounding the ball into David McCormack, who scored KU’s first five points on tough post moves in the paint. Those buckets were flanked by a couple of KU turnovers and 6-of-9 shooting from the fast-paced Tigers — including 3-of-4 from 3-point range — who picked up full court on defense from the jump and made Kansas uncomfortable all over the floor. Kansas called timeout at the 15:58 mark of the first half after a 3-pointer in front of the KU bench by Bryce Brown (25 points on 7-of-11 shooting from 3-point range), but got more of the same after getting back on the floor, via a Quentin Grimes turnover and another Brown 3-pointer from virtually the same spot. The result was a 15-5 Auburn advantage in first 4:45 of the game. 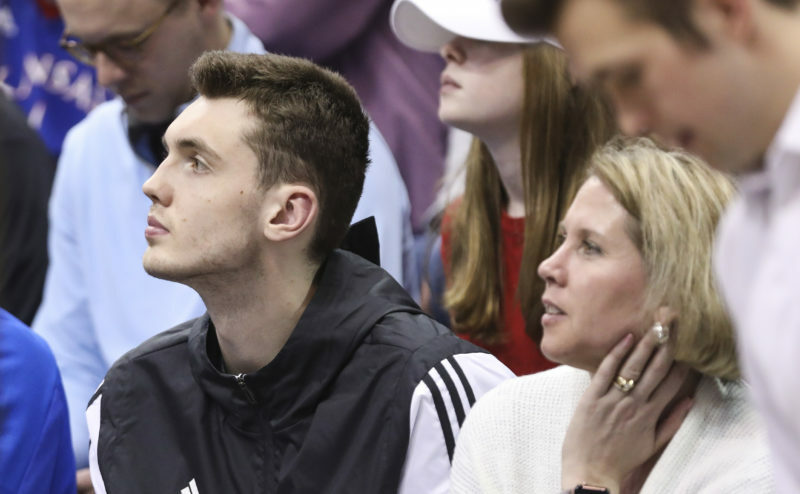 Things only got worse from there, as Brown cashed four early 3-pointers — all of them in front of the Kansas bench — and watched his point guard, Jared Harper, hit two of his own to push the Tigers out to a 28-11 advantage less than 8 minutes into the game. The Tigers hit 11 of their first 16 shots in this one, including a 6-of-8 start from 3-point range. Kansas eventually found its footing, which can also be described as Auburn cooling off, but even then everything the Jayhawks got was taxing. Rebounds were tough to grab or bounced away altogether. Trips to the rim that resulted in free throws came with heavy contact. And Auburn consistently looked and stayed one step ahead of Kansas for 20 minutes. By the 7:36 mark of the first half, the Jayhawks had proven that they were able to compete. But that did little good on the scoreboard, where Auburn still led 34-20. Perhaps the most disheartening moment of the first half — and there were many — came after a 3-point attempt by Auburn’s Chuma Okeke completely missed the rim and clanged off the far side of the backboard. Instead of the wild miss resulting in a possession for Kansas, Auburn’s J’Von McCormick outraced every Jayhawk to the ball and calmly flipped it to Brown, who buried his fifth triple of the first half as KU coach Bill Self helplessly watched the ball’s flight. Auburn led 40-20 and never again gave the Jayhawks hope. 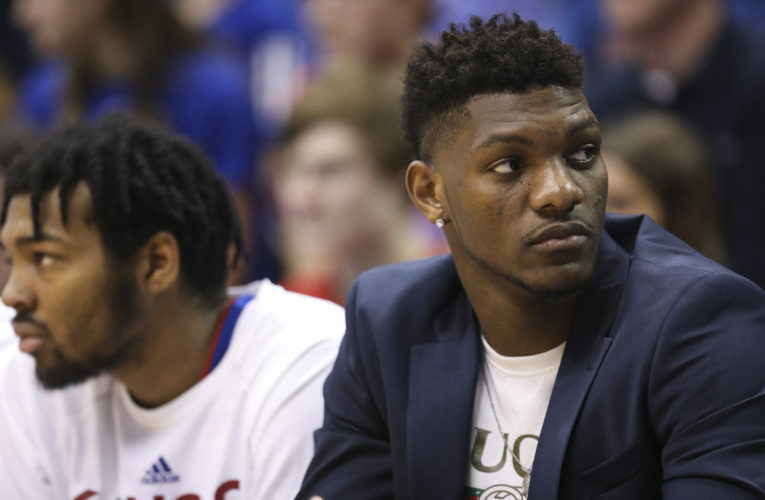 It was not just the KU players who were brutalized and battered by the Tigers. At one point in the first half, with Auburn leading by 21, Okeke went barreling into press row while trying to corral another steal and sent water running all over the KU radio broadcast. Phones, iPads, monitors and mic cords were saturated and the spill left the Kansas contingent trying to clean up the mess on and off the floor. It never happened — although the radio crew did dry out — and a Kansas basketball season fraught with frustration, difficulty and disappointment ended with a bunch of young players battling and a whimper. Auburn (28-9) moves on to next week’s Sweet 16 in Kansas City, Mo. 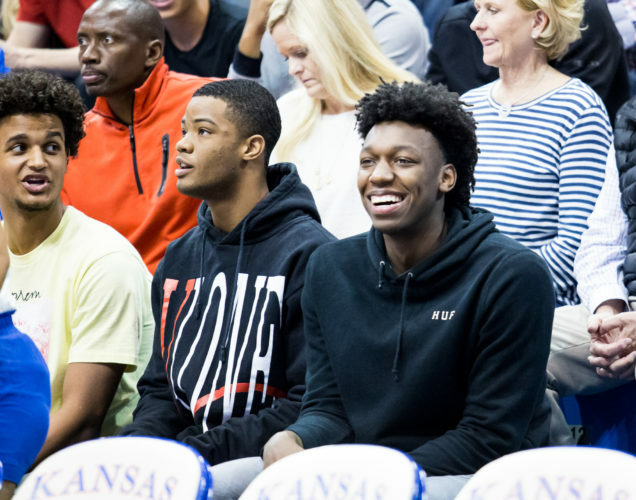 And Kansas moves on to see what comes next for its roster, its recruiting and its program. “It’s been a challenging year,” Self said. “I thought the kids hung in there and did a great job, for the most part. Their attitudes and everything (were) terrific. And we didn’t muster up enough momentum to go on a run like other teams have.